Hallowell's Highway Committee held a meeting Thursday to probe why officials shortened a Water Street sidewalk project without public notice. 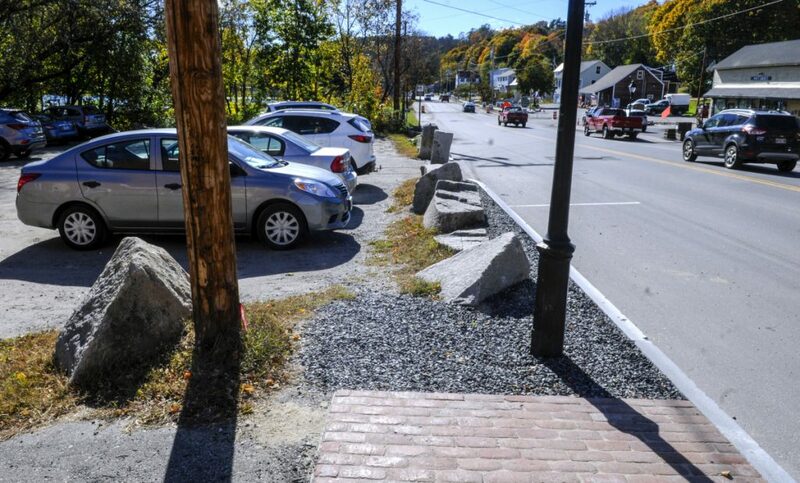 HALLOWELL — The co-owner of a Chinese restaurant said Thursday she wanted granite boulders outside the building left in place in order to maintain the “feng shui” of the area. It was a concession that some local and state officials agreed to in cutting short a new downtown sidewalk as part of the landmark Water Street reconstruction project. Some property owners and a city councilor, though, say the change was made without adequate public notice and upended their understanding of the project. Annie Huang, co-owner of the Lucky Garden with her husband, Tony, told members of the city’s Highway Committee on Thursday morning that the boulders prohibiting the sidewalk have cultural importance. The committee is looking into the sidewalk change because some residents say they are frustrated with the change after being led to believe that the sidewalk would connect the State Boat Landing to Granite City Park. Former Councilor Alan Stearns said the decision — which was made with little council briefing and no council action — also flies in the face of two previous council actions. Huang, who previously has declined to comment to the Kennebec Journal, said at Thursday’s meeting that the boulders were placed according to feng shui, a Chinese belief pertaining to design that promotes balance and energy flow. She said the feng shui would be thrown off if the boulders were moved back into the lot and that the boulders are a barrier from traffic on Water Street, and losing the parking spots by moving the rocks into the parking lot would affect their customers’ experience. Huang also said a sidewalk might not be necessary through her property because the sidewalk on the other side provides adequate access to the boat landing. 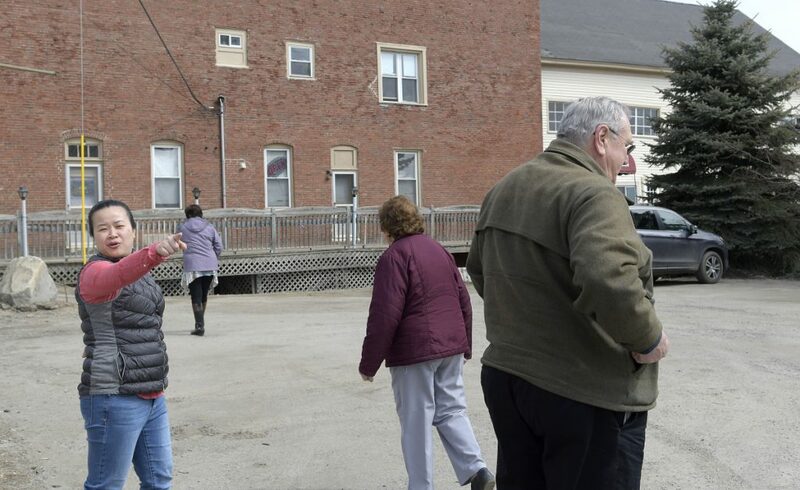 The Highway Committee, chaired by Councilor Lisa Harvey-McPherson and filled out by Councilors Michael Frett and Lynn Irish, met Thursday morning to discuss the controversial stretch of omitted sidewalk on the east side of Water Street. City Manager Nate Rudy, Mayor Mark Walker, Maine Department of Transportation Project Manager Ernie Martin and Lucky Garden abutter Jon Lund also spoke during the meeting. Before the meeting, Harvey-McPherson and Walker had cited “religious and cultural reasons” for not moving the granite boulders, without further explanation. The restaurant owners first expressed displeasure in February with plans to move the boulders into their parking lot to Rep. Charlotte Warren, who was not at the meeting, and Walker. The decision to stop the sidewalk was confirmed by Rudy on March 24 after a meeting between city officials, state officials and restaurant owners on March 21. Transportation department officials said Rudy made the final decision, while Rudy maintains that he was not aware at the time that he was the decision-maker, and the department usually involved the council when changes were made. The sidewalk extension is mentioned in two documents from 2014 and 2016, but the documents have wiggle room that could omit the sidewalk. During his comments confirming timelines with the committee, Walker also shouldered some responsibility for the stopped sidewalk not being decided on by the council. He said Rudy got “slammed” with the responsibility. On Thursday, Martin, the state transportation project manager, echoed his previous comments that the decision ultimately fell to the city. He said a decision was made by the property owner and confirmed by the city, and the department moved forward because the city added the sidewalk to the project. Walker has asserted that he briefed the council in March and in April vaguely about the meetings at which the sidewalk issue was decided, but said on Thursday that he spoke personally with Harvey-McPherson. Councilors have agreed that the briefings were vague, while some were unaware of them altogether. “I did not bring the whole issue to the Highway Committee and I did not brief the whole council on the details,” Walker said. Rudy, who has been Hallowell’s city manager since June 2016, said at Thursday’s meeting that he was not clear on his role, despite the transportation department’s assertions. Rudy told the Kennebec Journal previously that did not intend to circumvent the council, but said the decision warranted council action, like previous changes to the project. Walker also referenced confusion about his role, sparked by his prior representation of the restaurant as a lawyer. He said some transportation department employees believed he was the restaurant’s lawyer throughout the Water Street project. Lund said he was unaware of discussions regarding the Lucky Garden property. He said he accepted an offer for some of his land because it was being taken to build a sidewalk and the omission of that portion of the sidewalk has hurt his property’s value. “As far as I’m concerned, the change … reduced the value of my property over what I expected it would be,” he said. Martin said the Department of Conservation is looking to update the Boat Landing in the near future, with the transportation department handling some portions of the project. He said there would be “plenty of opportunity” to look at a sidewalk as part of that project. He said that decision would ultimately fall to the city and the transportation department already has the rights to build a sidewalk. Harvey-McPherson said she would prepare a report detailing the testimony from Thursday’s meeting prior to the City Council’s next meeting on Monday. This was the current committee’s last meeting, as Irish and Harvey-McPherson will not be councilors after Jan. 2.